I was raised in Auburn, California and now live in North Lake Tahoe where the stunning natural environment influences and often guides my expression. While ceramic sculpture was my emphasis when I received my degree in Fine Arts from Sonoma State University in 1995, I have continued to evolve as an artist through silk painting, oil pastels on paper, and designing and creating light fixtures of reclaimed wood, steel and willows. Several years ago, I began having vivid dreams of painting on old wood. When I shared this with a friend, who replaces and builds piers on Lake Tahoe, he offered to bring me the next pier he removed. My first deconstruction of an old Tahoe pier took place in August of 2014. 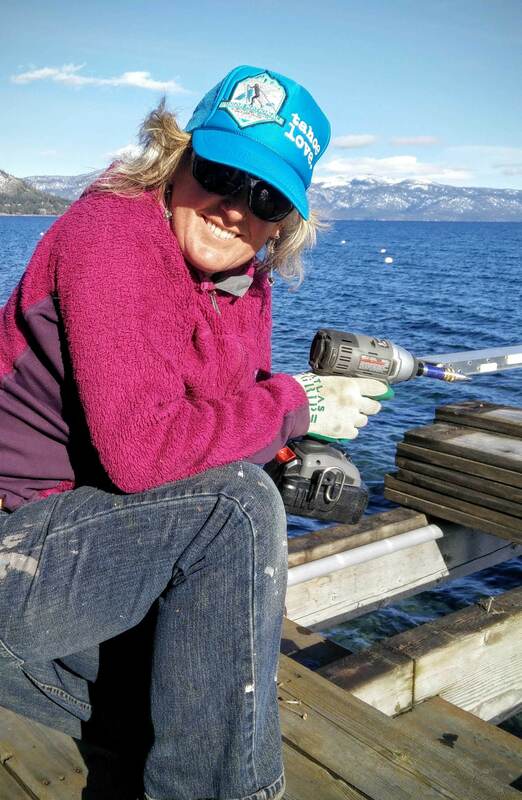 The physical labor of dismantling the pier provided me with a beautiful stack of reclaimed cedar to paint on and the process reminded me of stories my father told me of felling lumber and building piers on Tahoe in the 1950’s. Four years later, I am five piers in and still enthralled by the material, even if it does come with endless splinters. Harvesting weathered decking from piers is an arduous process, but it is invaluable: it creates and nurtures an intimate connection between me and the wood. With my paintbrush, I honor the knots, the exaggerated grain caused by erosion and the holes from nails and screws. When my paintings are complete, I move them from my studio to my metal shop where I cut the steel and weld the custom frames. I not only celebrate the life cycle of the wood, but I also recognize the relationship between the work my father did building piers and the work I do deconstructing piers to turn them into my canvas one generation later.